It may be the dead of winter with snow on the ground, but many gardeners are in a "seeding frenzy" and getting ready to plant their crops for this season. This is prime time for buying seeds and planting them to take advantage of short growing season. There are many great reasons for growing plants and vegetables from seeds. We caught up with the Seed Keeper Company on a recent Green Industry Leaders Network, #plantchat podcast everything you need to know. 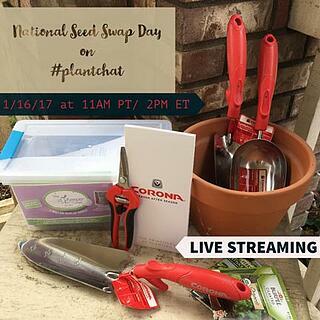 They share their passion and enthusiasm about the proper techniques to seed selection, storage and saving seeds to grow next season. If you are in the garden industry, you've likely met Carol Niec and Kerrie Rosenthal, owners of The Seed Keeper Company, an online resource and nifty product for storing and saving your seeds each season. SPOILER ALERT: We have one to giveaway to a lucky blog reader so stay tuned for your chance to win! They are both a wealth of information about the benefits of growing from seed, which can yield healthier plants and varieties you won't find at your local garden center. Carol and Kerrie explain what you need to know about seed selection before you purchase. Deciding what food your family enjoys most influences what you plant. Planting at the right time of year depending on where you live. Most gardeners know their climate Hardiness Zone but the knowing your growing season based on your last spring and first fall Frost Dates is going to determine when you sow your seeds. And of course, some basics of knowing your soil type, light requirements do different seeds need? O and open-pollinated. Since seed packets are a source of abundant information, they recommend you choose reputable brands. Find out which ones they like best. Discover how to save your own seeds! Follow their “good and dry” guidelines, and keep your seeds in a cool (40F), dark and dry place in their Seed Keeper Deluxe organizer, inside paper or glassine packets and add silica desiccants. Did we mention we're giving one away??? Finally, as a way to give back to the community, Carol and Kerrie started the Seed Keeper Project and work with 51 school gardens each year, selected from all 50 states plus the District of Columbia. The Month of January is the time to nominate schools from your state, on their Facebook Page. Corona Cares has participated in their Seed Keeper Project for nine years, and this year is donating three Corona Cares tool grants valued at $1,000 to each of three winning schools. Are you saving seeds? Please tell us in the comments below, and be entered to win a Seed Keeper Deluxe. 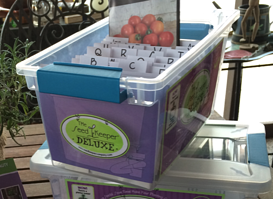 Tell us how you currently organize leftover and saved seeds and why you would benefit from this handy organizer. The winner will be chosen at random and announced on January 31, 2019. Open to all US addresses and good luck! Download and subscribe to the Green Industry Leaders Network podcast on Simplecast, iTunes or Google Play. Be sure to connect with Corona Tools and share your thoughts on this podcast. Be sure to connect with both our guest and with us on all our social media networks. Connect with Carol and Kerrie on Twitter, Facebook and Instagram. Connect with Chris at Corona Tools on Twitter, Facebook and Instagram.